Bridges have for long been symbols of modernity and progress and have given significant impetus to expanding urban centres. Not only do they dramatically reduce travel time, but they also make business more convenient and enable a faster pace of life. This list brings you the most famous bridges which have become monuments by themselves and stand tall and proud. This iconic bridge is located in San Francisco, USA and is operational since 1937. It is a very popular tourist attraction and has become a symbol of the city. It was painted a bright red-orange colour to make it easily visible during fog, which frequently surrounds the bridge. 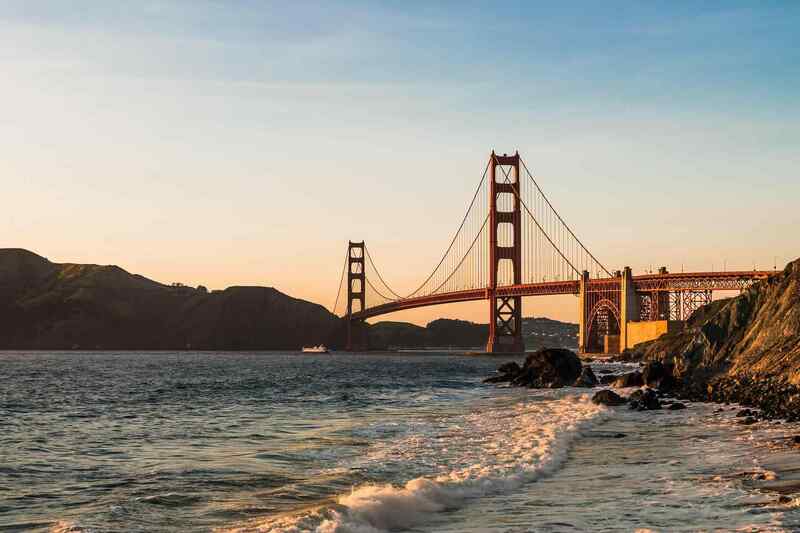 One of the best tourist attractions in California is an impressive feat of architecture and has a main span of 1280 meters, which was nothing short of a miracle when it was built eighty years ago. The total length of the Golden Gate Bridge is 2.73 kilometres and the total weight of the bridge is approximately 804,672 tonnes. The original design of the bridge has been produced by chief engineer Joseph Strauss in 1921 and considered as a hybrid of a cantilever and a suspension bridge that according to one critic resembled “an upside-down rat trap.” It took approximately four years and five months to complete the Golden Gate Bridge (January 1933 to May 1937). The total cost of the construction was $35.5 million and 11 died during the completion of the project. The bridge was opened for the public on May 27, 1937, and thereafter it becomes a symbol of city love and one of the famous bridges in the world. The Tower Bridge on River Thames in London is by far one of the most famous bridges in the world. It was completed in 1894 and derives its name from its proximity to the Tower of London. It is built on two levels, with the road passing from below and walkway passing from above. The lower is made of two halves which can be drawn apart to let large ships pass through, during which time the traffic is halted. You can also read about beautiful castles built around the world. The bridge was built by 432 workers and over 70,000 tons of concrete sunk to the bed of River Thames to support the bridge. The total length of the tower bridge is 244 metres (800 feet) long and each tower is 65 meters (213 feet) high. Initially, the colour of the bridge was chocolate brown, however, later it is painted red, white and blue in 1977 to celebrate The Queen’s Silver Jubilee. The tower bridge was opened for public in 1982 and later in 2014, it launched its most significant development in the form of the glass walkway. Built to connect the North Shore of the city to the central district, this bridge is located in Sydney, Australia. It was opened in 1932 and is the largest steel arch bridge in the world. Depending on the temperature, the bridge may expand and contract to lead to a height difference of 18cm. This famous bridge carries not only road traffic but also a railroad, cycle tracks, and pedestrian walkways. It is nicknamed “Coathanger” because of its peculiar shape. Sydney opera house located in Australia listed under modern architectural wonders around the world. Australia’s most well known and most photographed bridge also known as the ‘Coathanger’ was opened to the public on March 19th 1932 by Premier Jack Lang. The bridge was designed and built by British firm Dorman Long and Co Ltd of Middlesbrough and it took a total 8 years to complete its construction. The design was influenced by the Hell Gate Bridge situated in New York City and it is the sixth longest spanning-arch bridge in the world. The total length of the bridge is 1,149 meters, however, the arch span is 503 meters. This famous bridge connects the two areas of Brooklyn and Manhattan across the East River in New York. It was inaugurated in 1883 and is the oldest suspension bridges in the United States. It has become a famous tourist destination and the beauty is highlighted by the backdrop of the iconic Manhattan skyline. You will also find interesting reading about the most famous monuments of Ancient Egypt. The hybrid cable-stayed and suspension bridge in New York City connect two great New York City boroughs Manhattan and Brooklyn. The bridge was designed by German immigrant John Augustus Roebling and it was built by 600 workers to transform 6,114 tonnes of material into an iconic bridge. It is supported by cables which are 1090 meters long and 40 centimetres thick and made up of 21,000 individual wires. The bridge was first named as New York and Brooklyn Bridge, later, it became East River Bridge and finally renamed as Brooklyn Bridge in 1915. This medieval bridge was opened in 1345 and is the oldest bridge on this list of most famous bridges in the world. It is located in Florence, Italy and is the only bridge in the city to remain intact after World War II. The bridge is lined by shops – they were originally butchering shops, but now mostly sell souvenirs. The name Ponte Vecchio literally translates to “Old Bridge”. The first segmental arch bridge in the west is considered an outstanding engineering achievement of the European Middle Ages. The bridge is 84 meters long and 32 meters wide and consists of three segmental arches. The original designer of the bridge is still unknown, however, it is believed that it is either Taddeo Gaddi or Neri di Fioravanti. The two neighbouring bridges of the Ponte Vecchio’s are the Ponte Santa Trinita and the Ponte alle Grazie. There is a custom for lovers where they declare their eternal love by placing a lock on Cellini’s monument. This bridge built in Venice, Italy spans across the Grand Canal and is operational since 1591. It was built to replace an older wooden bridge that collapsed in 1524. Many architects of the time predicted that the bridge will soon collapse due to its unconventional design, but even today this famous bridge is a major tourist attraction of Europe. One of the famous bridges in the world, Rialto Bridge was designed and built by Antonio da Ponte and his nephew. The bridge spans a length of 31.80 metres, however, the lower cord of the bridge is only 25 metres in length while the width is 20 metres. Initially built as a pontoon bridge in the 12th century, later, it was built several times since its first construction. The bridge has three walkways two along the outer balustrades and the third one is little wider central walkway situated between the small shops of jewellery and other items for the tourist trade. Today, it is one of the most famous tourist attraction in Venice. This bridge is not only one of the most famous, but also the tallest in the world. It is built across the River Tran in Southern France and consists of seven piers of different heights connected by cables. It was opened in 2004 and is the tallest structure in France, taller than even the Eiffel Tower. The tallest bride in the world with a height of 343 meters is also one of the most famous bridges in the world. It was opened to the public on December 14, 2004, and made of several spans to cross the valley. This valley is over 8,000 feet long and very deep. The bridge was designed by French structural engineer Michel Virlogeux and British architect Norman Foster. According to the deck height of 270 meters, it is the highest bridge in Europe. The construction of this famous bridge started in 1357 but could be completed only by the 15th century. It is built across the Vltava River in Prague, Czech Republic and connects the Old town to the Prague Castle. It is built in the traditional Gothic style and attracts a large number of tourists even today. The stone Gothic bridge connects the Old Town and Lesser Town. The bridge is 621 meters long and 10 meters wide. The bridge originally called as Stone Bridge or Prague Bridge, however, later it is renamed as “Charles Bridge” since 1870. The bridge was decorated by a continuous alley of 30 statues and statuaries and most of them are baroque-style erected between 1683 and 1714. This bridge built across the Akashi Strait is the longest in the world and has four pillars to support the suspension cables. It is also the fourth tallest bridge in the world and connects the city of Kobe on Honshu Island to Iwaya. It was opened in 1998 and is also called the Pearl Bridge. Bridges are also used as bungee jumps in the world. The strongest and longest suspension bridge in the world spans a length of 12,831 feet and also known as ‘Pearl Bridge’. It serves as a link between the city of Kobe and Iwaya and four miles wide bridge has six lanes. The construction of the bridge started in 1988 and it took approximately 10 years to complete. The bridge is situated in the wind region where winds can reach speeds of 290 kmph. The famous tourist attraction in Japan has two beautiful parks known as Maiko and Asagiri constructed near the bridge. This bridge too was opened in 1998 and connects the cities of New Zealand and Funen in Denmark. It is the third longest suspension bridge in the world with a length of 6790 meters. Built across the Great Belt Strait, this bridge consists of five different structures like a suspension bridge for vehicular traffic, a railway line and a box girder bridge for road traffic. Before the bridge was built, people had to commute between the two cities by ferry. You can also read about largest countries in the world. The low level combined road and railway bridge connect the island of Sprogo and Fyn. The east side of the bridge was built between 1991 and 1998 and West Bridge was built between 1988 and 1994. The east tunnel Rail traffic is 8,024 meters long and it was built between 1988 and 1996. The substructure of the bridge was built with concrete and comprises pylons etc and steel structure was built with bridge spans and cables. What according to you makes a bridge famous? Is it the architectural expertise or the aesthetic appeal or is it the history of the bridge that attracts people to it? Bridges are the silent enablers of the fast city life; we all use one, but seldom realise the importance of it until it is no longer there.